The Andean Community is mainly a trade block formerly called the Andean Group (Grupo Andino, in Spanish) which saw light after the Andean Pact (Pacto Andino) or more formally the Cartagena Agreement (Acuerdo de Cartagena) was signed in 1969, in Cartagena (Colombia). The CAN (for its current abbreviation in Spanish) is a sub-regional organization endowed with an international legal status, which is made up of Bolivia, Colombia, Ecuador, Peru and Venezuela (see note) and the bodies and institutions comprising the Andean Integration System (AIS), which is a series of bodies and institutions that work closely in pursuing the same objectives: to intensify Andean sub-regional integration, promote its external projection, and reinforce the actions connected with the process. On September 20, the Ministers of Foreign Affairs and Foreign Trade of the current members of the CAN have issued a statement in New York recognizing the incorporation of Chile as full member, by Decisión 645 ( http://www.comunidadandina.org/prensa/notas/np20-9-06.htm ). Chile was an original member but it withdrew in 1976, rejoining in 2006. Venezuela was also an original country but it withdrew in 2006. The flag of the Andean Community (Communidad Andina or CAN) is their logo, which looks like a pattern from indigenous Andean textiles, in gold on a white backround. The flag of the Andean Community that appears in photos from their offical site has the logo roughly 1/3 hoist height. I believe the adoption of their flag, as opposed to their logo, may be brand new, considering that I browsed through many older photos of meetings without it (but that did have the national flags), and that the one that did have it is dated July 12, 2004 (yesterday) for the inaugural session of the 15th Andean Presidential Council. In 1999 these two organizations began negotiating a merger with a view to creating a South American Free Trade Area (SAFTA). 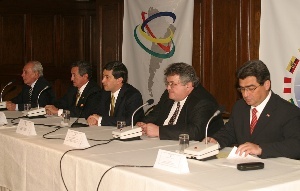 On December 8, 2004, during the III Summit of Presidents of South America, held in Cusco, Peru, the Presidents of Argentina, Bolivia, Brazil, Chile, Colombia, Ecuador, Guyana, Paraguay, Suriname, Uruguay and Venezuela signed a cooperation agreement, the Cuzco Declaration (http://www.comunidadandina.org/documentos/dec_int/cusco_sudamerica.htm) and they published a joint letter of intention for future negotiations towards integrating all of South America in the context of the CSN, Comunidad Sudamericana de Naciones (South American Community of Nations), patterned after the European Union. During 2005, Venezuela decided to join Mercosur. Venezuela's official position first appeared to be that, by joining Mercosur, further steps could be taken towards integrating both trade blocs. CAN Secretary General Allan Wagner stated that the Venezuelan Foreign Minister Alí Rodríguez had declared that Venezuela did not intend to leave the CAN, and its simultaneous membership to both blocs marked the beginning of their integration. However some analysts interpreted that Venezuela might eventually leave the CAN in the process. This prediction seems to have been finally verified in April 2006, with Venezuelan President Chávez's announcement of his country's withdrawal from the Andean Community after stating that, as Colombia and Peru have signed free trade agreements (FTAs) with the United States, the Community is "dead". Officials in Colombia and Peru have expressed their disagreement with this view, as did representatives from Venezuela's industrial sector (Conindustria). Despite this announcement, Venezuela has yet to formally complete all the necessary withdrawal procedures. According to Venezuela's Commerce Minister María Cristina Iglesias, the entire process will take up to five years. Until then, Venezuela and its partners remain bound by the effects of the community's preexisting commercial agreements. In this context, the CSN "will be a continent-wide free trade area that will unite two existing free-trade organizations�Mercosur and the Andean Community� liminating tariffs for non-sensitive products by 2014 and sensitive products by 2019. The headquarters of this new organization will be in Lima while the South American Bank will be in Brasilia according to the agreements during the meetings. Complete integration between the Andean Community and Mercosur into the South American Community of Nations is expected by 2007. On December 28, 2005, Chilean chancellor Ignacio Walker proposed that the name of the community be changed to South American Union (Spanish: Unión Sudamericana, Portuguese: Uniăo Sul-Americana); nevertheless, many members stated to him that that proposal had already been rejected to prevent confusion related to its acronym (U.S.A.)". The CSN does not yet have an official website, nor an official flag, but I saw a logo on a banner being displayed, with a white background, displaying the South American subcontinent on gray, plus several lines looking like rays, in blue, red, yellow and green. Source: Colombian Ministry of National Defense (http://www.mindefensa.gov.co/) published online on July 14, 2006.